President Donald Trump and Turkey President Recep Tayyip Erdogan at last month's NATO conference in Brussels. 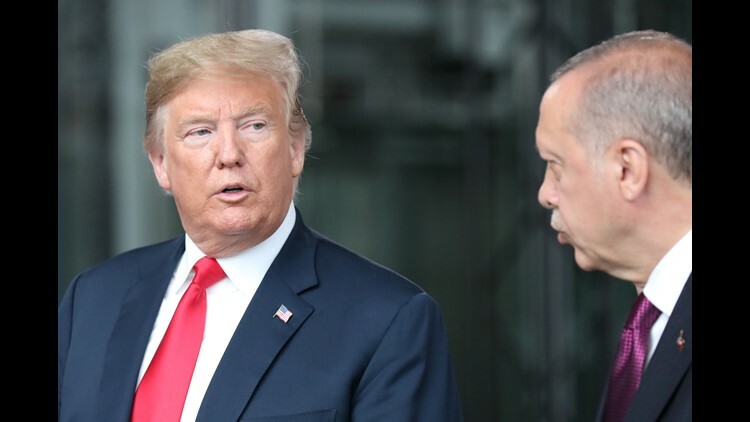 WASHINGTON – Wielding tariffs as a foreign policy weapon, President Donald Trump said Friday he would increase duties on steel and aluminum from Turkey as the two nations argue about a imprisoned American. "I have just authorized a doubling of Tariffs on Steel and Aluminum with respect to Turkey as their currency, the Turkish Lira, slides rapidly downward against our very strong Dollar!" Trump tweeted. "Aluminum will now be 20% and Steel 50%." The tweeted tariff threat came little more than a week after the Trump administration placed sanctions on Turkish officials over the imprisonment of American pastor Andrew Brunson, calling his detention "unjust" and "unacceptable." Those sanctions targeted Turkey’s Minister of Justice, Abdulhamit Gul, and Minister of Interior, Suleyman Soylu. Although narrowly tailored, those penalties have contributed to a slide in the value of the Turkey's currency, the lira, amid fears of a broad economic crisis. Bulent Aliriza, an expert on Turkey with the Center for Strategic and International Studies, a Washington-based think tank, said Trump's latest decision to ratchet up tariffs will push Turkey’s economy "into more difficult waters." White House spokeswoman Lindsay Walters said that Trump "has authorized the preparation of documents" to raise steel and aluminium tariffs on Turkey, citing a section of the U.S. trade law that allows penalties "on imports from particular countries whose exports threaten to impair national security." Turkey is a NATO ally. Turkish President Recep Tayyip Erdogan responded defiantly to Trump's announcement on Friday. “We will not lose the economic war,” Erdogan said during a tour of Black Sea provinces, according to the Hurriyet Daily News, an English language outlet. “This is a national struggle." Ruhsar Pekcan, Turkey's trade minister, said Trump's decision would boomerang back to hurt U.S. companies and consumers. “Turkey is deeply disappointed by the U.S. Administration’s decision to double steel and aluminum tariffs. The tariffs were groundless when they were announced in June, and remain so now," Pekcan said. "We implore President Trump to return to the negotiating table – this can and should be resolved through dialogue and cooperation,” the trade minister added. Aliriza said Trump's move will strengthen Erdogan in the short run, because it allows him to fan existing anti-American sentiment in Turkey. "It's difficult to be optimistic" about reaching a resolution to the standoff and lowering tensions between the two countries, he said. The proposed tariff hikes come just days after Turkey’s deputy foreign minister was in Washington to meet with U.S. officials on a range of contentious issues, including Brunson's detention. State Department spokeswoman Heather Nauert declined to detail those conversations Thursday during a briefing with reporters. "Obviously you all know that we have a very broad relationship with Turkey and a host of issues that we talk about with the Turkish government whenever we do meet," Nauert said Thursday. "Yesterday we had a wide-ranging conversation with Turkish government officials. We made it clear that Pastor Brunson needs to be returned home. Much of this, though, we’re not going to negotiate in public." She declined to say whether the two sides made any progress on the release of Brunson. “We would define progress as Pastor Brunson being brought home,” she said. Previously, Trump has used tariffs against countries he claims are engaging in unfair trade practices against the United States. The action against Turkey appears to flow from political differences between the two countries, particularly the Brunson case. Turkey accuses Brunson, arrested in 2016, of being a spy and says he was involved in an attempted coup. The United States says he has been falsely charged. Trump has discussed the Brunson case with Erdogan but has been unable to obtain the pastor's release. Erdogan said last week that U.S. sanctions will not affect the Brunson case. "We will not give any credit to this type of threatening language," Erdogan told reporters Wednesday in Ankara. "It is not possible for us to accept that America gets up, especially with an evangelist, Zionist mentality, and uses this kind of threat-filled language."